The best of Swahili Bongo Music. Download, listen & Share. 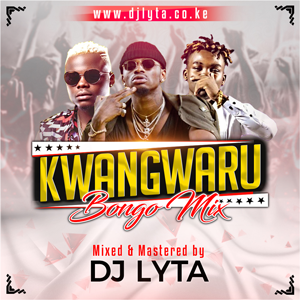 Thank you Dj Lyta for this Kwangwaru Bongo Mix 2018 . Moto sana! dj lyta thank so much bro you have really inspired me.Since i started listening to ur mix i deeply depeloped that desire of being a super dj ka wewe. For now me n deejay bt style nakutabua too xana my deejay. Wish pia my name one day to grow big ka iyo yako. Then i kindly request ka unaeza nipa some of ur tips to improve my deejaying , ama kitu ka advice abt deejay in kenya naeza appreciate xana xana kabsa,Thanks for taking ur tym to ready my comment. dj lyta thank so much bro you have really inspired me.Since i started listening to ur mix i deeply depeloped that desire of being a super dj ka wewe. For now me n deejay bt still nakutabua too xana dj lyta. Wish pia my name one day to grow big ka iyo yako.